On the heels of naming gun-banner Rahm Emanuel as his chief of staff, Barack Obama once again puts the lie to his supposed support of the Second Amendment by selecting former Clintonite and gun-hater Eric Holder as attorney general. President-elect Barack Obama`s nomination of Eric Holder for attorney general is terrible news for the Second Amendment--and for the rule of law. In the Clinton administration, Eric Holder served as deputy attorney general--the second highest-ranking position in the Department of Justice (DOJ)--under the infamous Janet Reno. Holder`s performance then and afterwards showed that he was a perfect fit for a department run by one of the worst, most lawless attorneys general in American history. The Reno-Holder brief argued that the Second Amendment protects a "collective" right, not an individual one, and asserted that belief in the collective right had been the consistent policy of the U.S. Department of Justice since the Franklin Roosevelt administration. A brief filed by some other former attorneys general and DOJ officials took issue with the Reno-Holder characterization of DOJ`s historical position. But the Reno-Holder brief did accurately express the policy of the Department of Justice when Janet Reno was attorney general and Eric Holder was deputy attorney general. At the 2000 oral argument before the Fifth Circuit Court of Appeals in United States v. Emerson, the assistant U.S. attorney followed the Reno-Holder line, and told the judges that the Second Amendment was no barrier to gun confiscation, not even to the confiscation of guns from on-duty National Guardsmen! The Supreme Court`s decision in District of Columbia v. Heller unanimously rejected the Reno-Holder theory. The five justices in the majority, led by Justice Antonin Scalia, recognized that the Second Amendment protects an ordinary individual right, similar to the First Amendment rights of freedom of speech and free exercise of religion. The four dissenters, led by Justice John Paul Stevens, agreed that the Second Amendment protects an individual right, but argued that it applies only to people serving in official state militias. So to Holder, a decision allowing guns in the home means "putting guns on the streets," and allowing people to have "access to guns" is bad in itself. Notably, not one justice agreed with the Reno-Holder assertion that the Second Amendment protects a "collective right," which belongs to nobody at all. The "collective right" version of the Second Amendment is as self-evidently absurd as the notion of "collective property" in a Communist dictatorship; supposedly the property right belongs to everyone "collectively," but in practice it belongs only to the government, and no person has any rights. 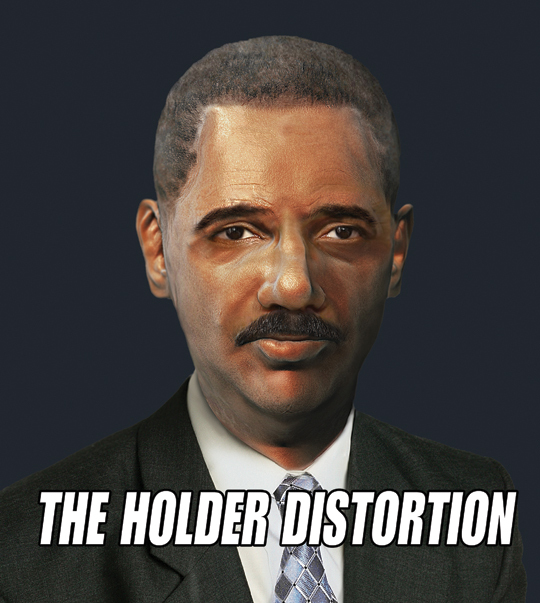 As deputy attorney general, Holder worked hard to restrict gun ownership. He advocated federal licensing of hand-gun owners, a three-day waiting period on handgun sales (even though the National Instant Check System does its work in a few minutes to a few hours), rationing handgun sales to no more than one per month, banning possession of handguns and so-called "assault weapons" by anyone under the age of 21, a gun show restriction bill that would have given the federal government the power to shut down all gun shows, national gun registration and mandatory prison sentences for trivial offenses. He also promoted the factoid that, "Every day that goes by, about 12, 13 or more children in this country die from gun violence"--a statistic that is true only if one counts 18-year-old gangsters who shoot each other as "children." Gangsters murdering each other is a serious problem, but it is less than honest to describe the problem as involving "children"--as if the gangsters were innocents, rather than criminals who deliberately put themselves in harm`s way. ?? After the 9/11 attacks, Holder penned a Washington Post op-ed titled "Keeping Guns Away From Terrorists," arguing that a new law should give "the Bureau of Alcohol, Tobacco and Firearms a record of every firearm sale." In other words, if you sell your brother-in-law a gun, both of you and the gun ought to be entered into a federal gun registration database. As Florida State University professor Gary Kleck has observed, none of the purported purposes of gun registration make sense. Every stated objective (e.g., keeping guns away from criminals or terrorists) can be served just as well by other measures. The only thing that gun registration accomplishes and that other measures do not is making gun confiscation much easier. Holder also argued that prospective gun buyers should be checked against the secret "watch lists" compiled by various government entities. That is, if a federal official puts you on a secret list, you should automatically lose your right to arms--with no due process even if you can prove that you are entirely law-abiding. In 2007, the D.C. Circuit Court of Appeals ruled that the D.C. handgun ban and self-defense ban were unconstitutional. (That was the case that D.C. appealed and lost in the Supreme Court in 2008.) Holder complained that the Circuit Court decision "opens the door to more people having more access to guns and putting guns on the streets." So to Holder, a decision allowing guns in the home means "putting guns on the streets," and allowing people to have "access to guns" is bad in itself. As attorney general, Holder will have many opportunities to implement his anti-freedom beliefs. The attorney general is the boss of the U.S. Attorneys` Offices all over the country; these attorneys are the front-line legal enforcers of the federal criminal laws governing guns, and of the regulations imposed by the Bureau of Alcohol, Tobacco, Firearms and Explosives (BATFE). When Reno and Holder ran the DOJ, the U.S. Attorney`s Offices aggressively prosecuted gun owners and sellers, often on flimsy charges. We can likely expect many more such prosecutions under Holder. In addition, the attorney general determines the official legal position of the U.S. government in everything from a trial court in Guam to arguments before the U.S. Supreme Court. Under the Bush administration, the DOJ attorneys have acknowledged the Second Amendment`s protection of an individual right, and they have avoided taking the most extreme positions to limit that right. For example, in the aftermath of Heller, the U.S. attorneys fought to uphold the federal laws that ban certain "prohibited persons" (e.g., convicted felons, persons dishonorably discharged from the military) from possessing guns. But the attorneys did not tell courts that gun restrictions must be upheld whenever there is a "rational basis" for the restrictions. In practice, the government wins well over 99 percent of cases decided under a "rational basis" standard.